This section explains how to configure audio and vibrate options of the device, as well as Profile settings, which control how data is manipulated before and after being sent to the PC. CartScan provides control over audio and tactile feedback to indicate each successful scan. This allows audio feedback, for example, to be disabled on the mobile device so as not to disturb patients. The CartScan Home screen displays ON/OFF switches to set audio and vibration feedback when scanning. 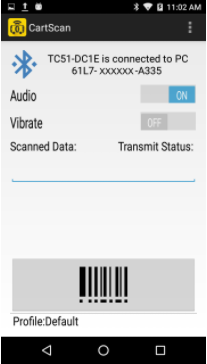 Note: These settings apply only to barcodes scanned with CartScan; sounds and feedback settings of other apps and the system are not effected by these controls. CartScan behavior is controlled by Profiles, which define how acquired data is processed and delivered to a line-of-business (LOB) application. Profiles also can be used to control cursor movement. For example, the addition of a TAB keystroke at the end of an acquired data string moves the cursor to the next field after the data is deposited into the current field. See the ADF Keystrokes section of this page for more information. 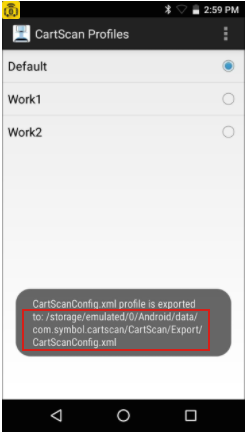 IMPORTANT: Do not modify CartScan Profile settings from within DataWedge on the mobile device. Doing so results in unpredictable CartScan behavior. Ignore Session Timeout - maintain the connection indefinitely (or until the user exits the CartScan app or the mobile device moves out of range). Disabling the session timeout is strongly discouraged. Session Timeout - sets the length of time (from 1 - 60 minutes) to maintain the Bluetooth connection between the mobile device and the PC during periods of inactivity. Default = 2 minutes. Active only when Ignore Session Timeout is disabled. Enable/disable BT Output - provides a measure of security by restricting delivery via Bluetooth of acquired data to the application running on a PC. If this setting is disabled, the scanned data is not delivered to the connected PC. Data formatting provides an easy way to append or prepend acquired data with custom values or keystrokes before passing it to the LOB application on the PC. This can be useful for adding application-specific characters to acquired data or for sending an ENTER and/or TAB character after submitting the data to advance the cursor to the next field. Enable/disable data formatting - controls access to Basic or Advanced Data Formatting functions. If Data Formatting is not enabled, scanned data is passed to the LOB application without modification or extra keystrokes. Appends or prepends acquired data with a simple set of values and special keystrokes. 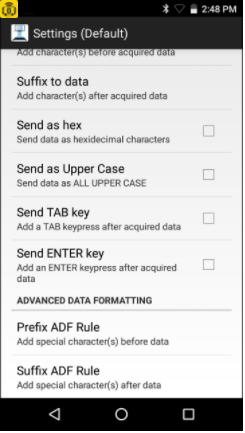 Prefix to data - adds (prepends) the specified character(s) to the beginning of the acquired data before sending. Suffix to data - adds (appends) the specified character(s) to the end of the acquired data before sending. Send as hex - sends the data in hexadecimal format. For example, if the acquired barcode data is 012345, this option sends the hex equivalent of 303132333435. Send as Upper Case - sends the data in all caps. For example, if the acquired barcode data is abcde, this option sends the string of ABCDE. Any selected prefix and/or suffix data also is converted to upper case, as appropriate. Append or prepends acquired data with special characters and keystrokes such as functional keys, mouse clicks, spaces and num-lock characters. Prefix ADF Rule - Can be configured as displayed in the following table. Keys can be selected from the scrolling list without manually entering the details. Suffix ADF Rule - Can be configured as displayed in the following table. Keys can be selected from the scrolling list without manually entering the details. NOTE: ADF keystrokes are visible only in the LOB application on the PC and not in the CartScan app. Only the Advanced Data Formatting options listed in this table are supported. Only the Advanced Data Formatting options listed in the table above are supported. Once CartScan is set up and configured as desired on a device, settings can be saved to a file and distributed to other devices either manually or using a Mobile Device Management (MDM) system. 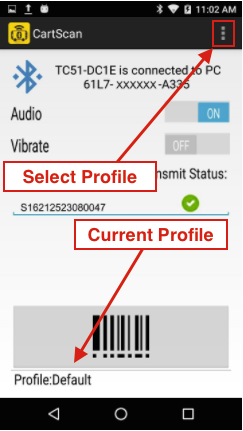 Profiles created with CartScan will work on all Zebra devices that support CartScan. 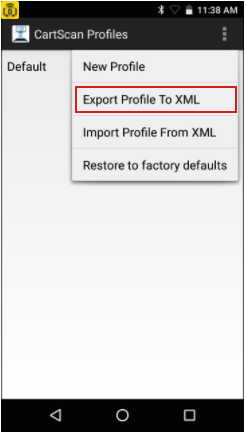 Settings for all the Profiles on a device are saved in a single file called CartScanConfig.xml. This file can be exported, distributed and imported onto other devices, where its settings are activated automatically. Place checkmark(s) next to the Profile(s) to export. All selected Profiles will appear on the destination device just as they do on the source. Tap "Export" when all desired Profiles are selected. 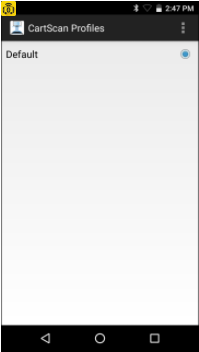 The config file can be viewed using the File Browser on the mobile device. Information about the Profile active on the mobile device is not contained in the exported file. An imported Profile must be set as the active Profile either manually or with an intent (See Import Notes, below). CartScan configuration (.xml) files exported from one mobile device can be imported onto other mobile devices automatically or manually after being pushed to the device using a Mobile Device Management (MDM) system or other means. Tap the HOME key to quit CartScan. 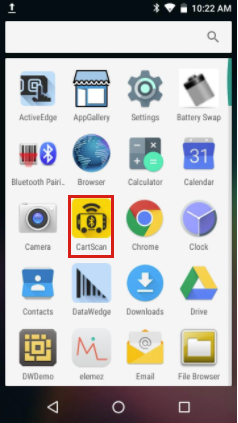 New settings are applied the next time CartScan is launched. 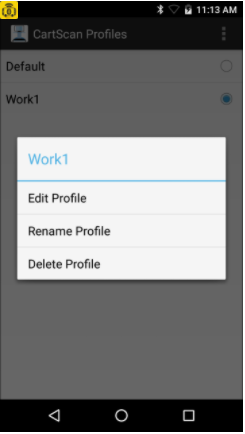 AllowProfileEditing controls the ability of a device user to make modifications to Profile settings of an imported file (default = false). When AllowProfileEditing is set to FALSE, some menu items are disabled. **This can be undone only by deploying a new configuration file with AllowProfileEditing set to TRUE. 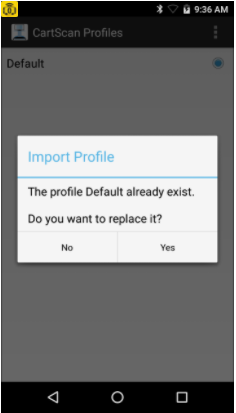 RestoreToDefault (when true) replaces all existing Profiles on the mobile device with those of the imported file and resets the default Profile to its default values without user confirmation (default = false). 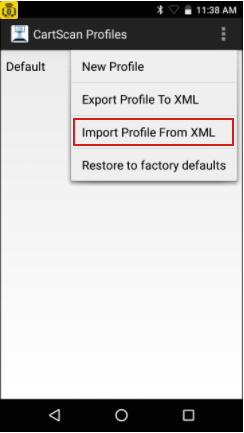 Remote configuration and importing a Profile XML file locally do not change the active Profile unless the RestoreToDefault parameter is set to TRUE. 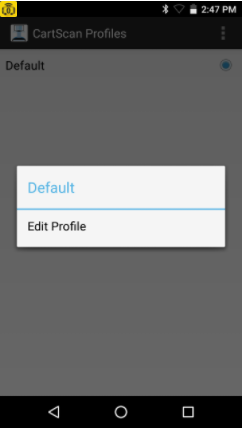 If RestoreToDefault is set to TRUE, the selected Profile replaces ALL existing Profiles and is set as the default Profile. 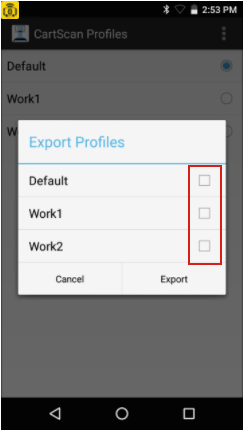 An imported Profile is not automatically selected as the active Profile. If RestoreToDefault is set to FALSE, new Profiles are added to the existing Profiles. See the Intents section for more information about sending and receiving intents. 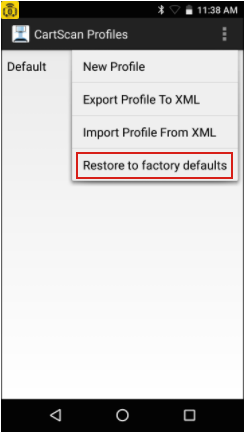 Tap "Restore" to confirm resetting the device to factory defaults. Push the config file to /sdcard on the mobile device. Send intent to com.symbol.cartscan.ConfigIntentService with the XML file path. A sample of the CartScanConfig.xml is shown below. This file can be displayed on the mobile device and viewed or edited on a PC using an ordinary text editor. Note: The CartScan 2.1 parameters indicated below cannot be controlled remotely through the config file. This code sends an intent to CartScan with the path to the config file on the device. Register to receive CartScan broadcast intents. Code for writing the broadcast message to the device log.